Fix the issue of your chrome or Mozilla Firefox showing only plain text page not loading properly. The error happens due to AdBlockers or browser extensions. Do the website loading text only in your Chrome? Do web pages displaying text only while accessing online? Facing an issue with plain text only? Why some websites showing text? or page not loading at all? 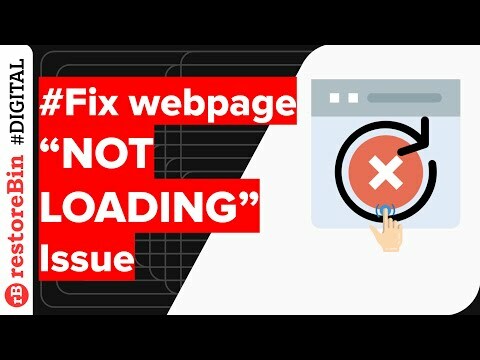 If you’ve encountered with the loading issue of web page or website in your browsers like Chrome, Firefox or Opera on your PC or Mac then you’re at right place. Today I’m going to share a couple of solutions and a definite fix for website appearing as text only. The problem which we generally encounter is the page not loading properly and shows only plain text with a white background without any image, graphics or colors. How to fix web page showing text only on your browser? What resolved your problem with text display? Note: please try this very carefully, since editing host file can also terminate your internet access on your system. If there are no blocking URLs in your host file, skip to next solution. This is a very basic and most common solution available online. All you need to hit Hard-Refresh in your browser so that new files are loaded from the website instead of the browser cache. The hard refresh will try to fetch the new files from the website server instead of locally stored in the cache. This will eliminate the content issue and load fresh elements are not available in browser storage. As I said the browser extensions can many times interfere with page layout due given its working structure. The error generally occurs in Google Chrome, Mozilla Firefox or for such instance in any other browser which allows browser extensions and add-ons. Many times the main culprit is Adblocker extensions like AdBlock Plus, AdBlock, AdGaurd, Ghostery etc. Same applies for Mozilla, you can delete the add-on and re-install it. If the issue still persists, the pause the AdBlocker for the time being and start browsing without text loading issue. I recently had the problem when I trying to access Flipkart.com, and after checking the browser console error I got to know that Ghostery extension was creating an issue with proper loading. Follow below guide for Google Chrome browser or Firefox browser, however, the steps may differ. 1. Click on the upper right of the browser toolbar. 4. Place a select in the following checkboxes: Browsing history. Download history. Cookies and other site and plug-in data. 5. Select the beginning of time from the drop-down menu. Note: Clear browsing data will actually remove locally stored cache and cookies. Hence, you may need to re-login into all the website, however, the passwords and auto-form will stay in-tact. I was also having the text only issue with loading Google AdWords (Ads) home page. I quickly captured a video demo to explain the troubleshooting steps and also fix the problem. I hope this will help you as well and please subscribe to my youtube channel. The main culprit in my case was the Adblocking extension that was installed on Chrome browser. I temporarily deactivated the AdBlocker and refreshed the page. The content started displaying correctly without any issue. If you have any other problem or still facing issues with the browser. Do comment below for assistance and suggestions, happy to help. If you've any thoughts on Page not loading properly and display text only [4 easy solutions], then feel free to drop in below comment box. Also, please subscribe to our restoreBin YouTube channel for amazing videos tips. Cheers! I think you are missing a step in Solution 1 – after C: Drive, there should be Windows folder, then System32 as seen elsewhere. Anyway, that is not working, and I can’t find any Ad Blocking. The clearing of cache didn’t do it either so I’m really stuck now. Hi John, thanks for suggesting the correction and sorry to know that solution didn’t work. Can you try ‘hard refresh’? Let me know if this resolves your error. Thank you again! No, Ctrl + F5 does not fix it. I have used just F5 previously or Ctrl + R but nothing. Strange thing is, even on the iPad, the forum does not load properly. It is forexfactory.com if you want to check it. I have cleared cache 3 or 4 times, getting tired of logging into all these sites, hard to remember all passwords. I have checked Chrome settings (ads, images) reloaded Chrome, restarted computer, really don’t know what happened. With EDGE browser the same, so I’m thinking it’s not me? But I don’t see any complains on that forum by anyone about display issues, it’s a mystery to me. Hello John, thanks for checking back. I tried loading the mentioned website, didn’t encounter any issue. The site is loading fully without issue, even console didn’t throw any blocking problem. Not sure if this is something problem with your ISP or system since you’ve already tried on a different browser. Can you check your Browser Console to find out if any website element is blocked? Chrome Browser: Hit on Options (three vertical dots) > More Tools > Developer tools. This should popup a developer window within the Chrome browser, just switch to the ‘Console’ tab and reload the website. Go through the console records to find any missing or blocking elements. If any of your browser or system firewall is blocking the elements, fixing that will automatically resolve the issue. Let me know how this goes. Thank you! 5. Select the beginning of time from the drop down menu. The mentioned is actually solution #3. Making the changes in #1 title and also solution #3 entry right away. Aaha, that’s the problem everyone is facing on the website. Thanks, Erebus for the update! No worries, here is the confirmation from above! I am responding to the post you made here. We regret any inconvenience! We made some updates to the site on Friday, which obviously resulted in some issues. We’ve ironed them out, but you will have to conduct a “hard refresh” (Ctrl+F5) on the site. This should iron out any issues you are experiencing at the moment. If the issues still persist, please contact me via email with a screenshot and we’ll get you squared away! Thanks again and I look forward to hearing from you! Thank you again, Erebus for updating here! Seems like they have fixed the issue, and of course, you’d need to hit “hard refresh” to make sure the server files are loading from the website instead of the browser cache. Hello Everyone! Just an update here, I published a video on this solution. Hope you’ll find this helpful. The extension in Chrome called Privacy Badger ended up being the culprit for me. When I disabled it for the websites that were showing up in plain text, it ended up displaying the website properly.